Saddleback Ledge Light as seen from the schooner Mary Day during a recent windjammer lighthouse tour in Maine. Good morning everyone. I am back ashore for the winter. The schooner is under wraps (more on that later). Autumn is descending on the Camden Hills in all its glory. And now I have a few moments to sift through my laptop folder titled “Unedited Images”. Most of it is junk but the memories stirred of one of the best summers of my life will keep me warm all winter. Pictured above is the present day Saddleback Ledge Light built in 1839 and automated in 1954. At the outer edge of Isle Au Haut Bay in eastern Penobscot Bay this rock and its lighthouse have always captured my imagination. How miserable a place to be stationed and at the same time how awesome and beautiful it must have been to live and work there. Imagine the energy of the entire North Atlantic knocking on the door in a southeasterly gale. Imagine a family of nine living in such cramped quarters. And you thought the schooner cabins were a little tight? The image below shows the vastly expanded living quarters added on to Saddelback Ledge Light at a later date. 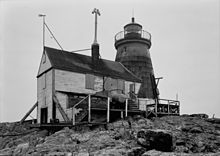 Pharologist Jeremy D’Entremont has some great information about the Saddleback Ledge Lighthouse that is fun to look at. 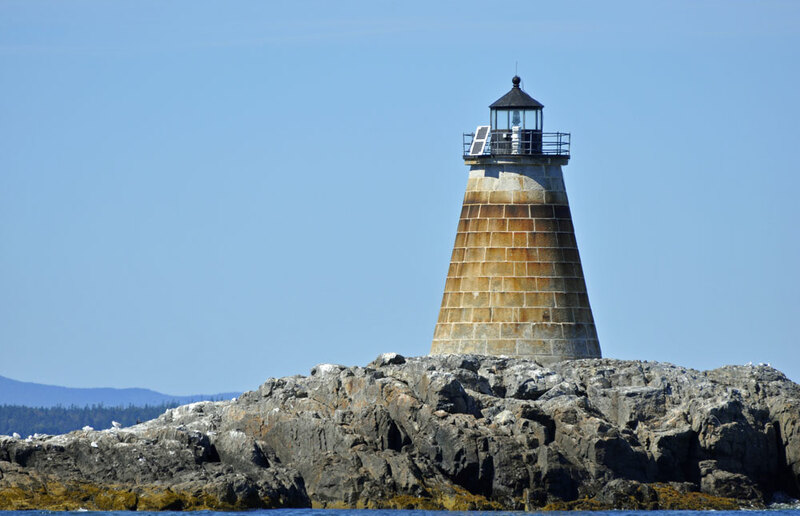 Posted in camden windjammer cruises sailing vacations, lighthouse tours in Maine, Windjammer Cruises in Maine and tagged Lighthouse tours, Maine lighthouses, windjammer vacations on October 8, 2013 by Capt. Barry.